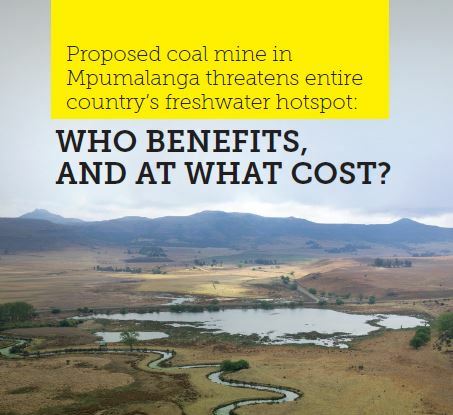 A new fact sheet – presenting the facts on the devastating implications of a proposed coal mine in the Mabola Protected Environment – was published by a coalition of eight NGOs and community organisations, earlier today. The Mabola Protected Environment is situated outside Wakkerstroom in Mpumalanga and falls within what has been classified as one of 22 Strategic Water Source Areas by the South African National Biodiversity Institute, a government body, and the Council for Scientific and Industrial Research. Strategic Water Source Areas are the 8% of our land that provides more than 50% of our freshwater. The coalition consists of non-profit organisations working to realise people’s Constitutional environmental rights to clean air, clean water and health, and sustainable, decent jobs. They are: groundWork, the Mining and Environmental Justice Community Network of South Africa, Earthlife Africa Johannesburg, Birdlife South Africa, the Endangered Wildlife Trust, Federation for a Sustainable Environment, Association for Water and Rural Development (AWARD) and the Bench Marks Foundation, represented by the Centre for Environmental Rights. 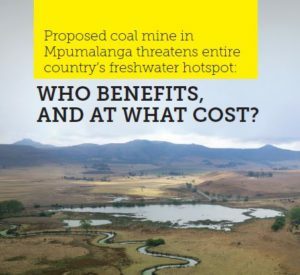 “The organisations opposing this particular mine do so because the proposed mine would be inside a declared protected area and a strategic water source area: with acid mine drainage estimated to require water treatment until 2097, the mine would threaten water security not only in the local area, but in the region. The damage that this mine would do to water resources cannot be undone. Click on these links to view the in English or isiZulu. Contact: Annette Gibbs, Communications Manager, Centre for Environmental Rights on 021 447 1647 or agibbs@cer.org.za.